**Guest post written by Patrick Hertz of Tinderbox Music. This article originally appeared on the Sonicbids Blog. "College radio is a unique mix of non-commercial stations that range from small-watt student-run operations to huge, vastly influential public and/or community stations. This spectrum allows for most any independent artist to find terrestrial radio airplay – that is, of course, if the music is good. CMJ (College Music Journal) defines the parameters for which non-commercial stations we can consider "college market" stations. What counts as a “college market” station? There are many other non-commercial stations out there, so don’t get confused if your promoter considers one student-run station a “college” market station, and another station at a different school not a “college” station per se (even though it may be run by a college, and don’t get me wrong… it’s not to say that a non-CMJ station is not still a valuable station). The big difference, though, is whether or not a station reports to CMJ. Promoters are most concerned with CMJ’s coveted Top 200 College Radio chart, which is published weekly. These Top 200 charts are compiled each week from all of the individual reporting stations’ Top 30 charts. If you’re going to promote your record nationally at college radio, focusing on the stations that report to CMJ will allow you to have the best opportunity to chart on the national CMJ charts. How do you get on the air? Your music – plain and simple – is what drives you into the playlists at college stations. But the trick is getting your music heard by a station’s music director. Many independent artists decide to hire companies like Tinderbox, Team Clermont and others who already have relationships with music directors across the country to manage the promotion process. Why is it so frequently outsourced? Well, it’s because it’s a lot of work. First of all, you’ve got to get your music to the right person, and it takes a whole lot of time to maintain a database of all the CMJ reporting stations, their current addresses, their current music directors, their current phone numbers, their current email address, etc. Some stations even have multiple music directors for different genres! Most of this information can be found by searching individual stations’ websites or by using resources like www.indieonthemove.com or www.radio-locator.com. The next challenge in the college market is keeping up with the constant changeover. The frequent turnover means a lot of data online is simply not up-to-date. As promoters, we spend hours and hours each week on the phone with the CMJ stations out there to stay on top of the current contact info. In addition to staying on top of who is where and when, we call each station to track our artists’ radio results. 1. The first step is to dial in when you’re going to release your record to radio. The phrase we use at radio to describe your release date is “going for adds date,” or simply just the “add date.” It’s called that because it’s the day your record is trying to get added to the stations available for airplay. These days are always Tuesdays, and there is one add date each week of the year, except for the weeks of Christmas and New Year’s. 2. Once that’s planned, physical CDs and one-sheets need to be mailed to the stations about two weeks in advance of the add date (typically we do 11 calendar days). This way, your discs arrive with enough time to be reviewed before your add date. It also keeps the stations on the same time frame for charting purposes. It’s important to note that you need quite a few stations to chart your album in the same week to make the national charts; it’s a tricky feat! 3. Once your discs are mailed, there will be at least one week before your add date, and preliminary calls/plugs can be made. Again, most of this is done over the phone and is more appropriately managed by a promoter or your label. 4. When your add date comes around, your promoter or label will start tracking the record’s progress to find out how much it’s being spun, and whether stations are adding or passing on it. Remember that stations can spin records in light, medium or heavy rotation, so the amount of play may vary station to station. Of course, if they really love it, they might even chart the record. Airplay charts are based on the most spun and favored records per the music director’s discretion. The tracking process typically lasts eight weeks, and if you’re working with a promoter you should receive reports along the way. Tracking is primarily handled over the phone. Your promoter will call the music director(s) at each station to inquire about the status of your record. This data is recorded and organized into the reports you receive throughout your campaign. This way you’ll know who has been spinning your record and to what degree. Does college radio still matter? Yes! 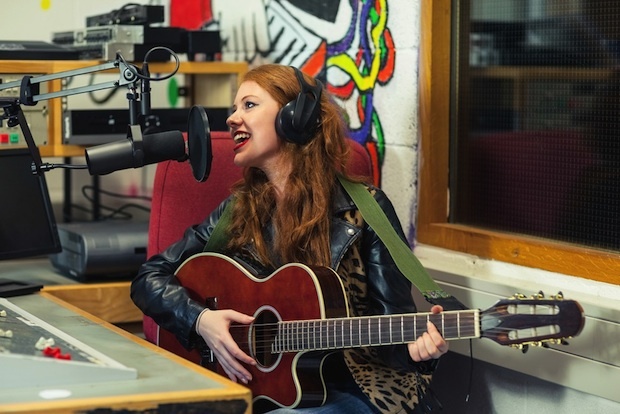 The college radio marketplace is still essential to any indie marketing plan and is a great way to get your music heard. College stations are dedicated to playing new music and, unlike bigger stations, they have the freedom to spin great new music based on its merit rather than advertising dollars or anything else. As an indie band, radio results can be used to boost your accolades and make yourself more attractive to venue promoters, management, labels, press, music supervisors, etc. And if you’re a touring band, you can use radio to guide your way into new markets and have the station(s) as an ally in those new markets. +How Do I Plan a Tour? It’ll take time to develop your presence in the college radio market, but keep at it and keep releasing great new music, and you’ll reap the rewards!" Patrick Hertz graduated with his BA in Music from the University of Minnesota. He has had the privilege of working alongside, and mentoring with, his industry veteran cohorts at Tinderbox for several years now, which has provided him a wealth of knowledge from all industry perspectives. Patrick’s expertise is in the college radio market, but he also has experience placing his clients' music on network television.